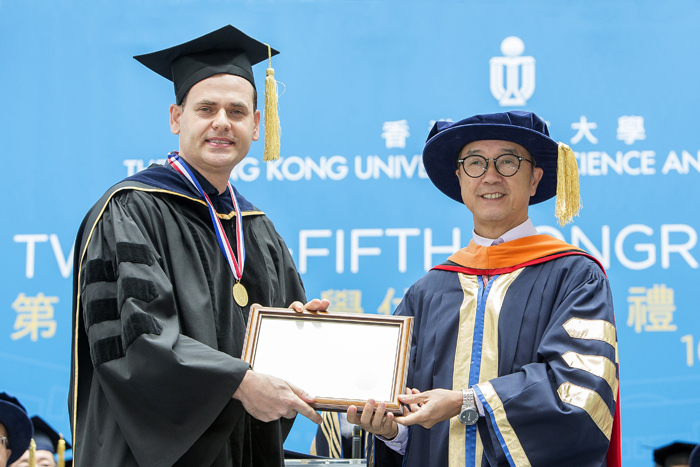 The HKUST 2017 Michael G. Gale Medal for Distinguished Teaching is awarded to Dr. David Rossiter for his outstanding teaching activities. The Medal is awarded each year at the University's Congregation to a member of the academic staff who best exemplifies continued pursuit of excellence, devotion to teaching, and the ability to inspire and motivate others. The recipient is representative of the high quality of teaching and learning that the University offers and promotes. Dr. David Rossiter received the Michael G Gale Medal for Distinguished Teaching from President Prof. Tony F Chan at the University's Congregation on November 16, 2017.